Christoph Bode, Professor of English at LMU, has just published the results of his ERC-sponsored project “Narrating Futures” – in five volumes. With the help of a team of five co-researchers, Professor Christoph Bode, who holds the Chair of Modern English Literature at LMU, has devoted the past three years to a research project entitled “Narrating Futures”. The goal of the project was to elucidate story-telling strategies adopted by authors who consciously attempt to reflect and preserve the fundamentally open and undecided nature of the future in their narrative texts. The results of this interdisciplinary project have now been published in a set of five linked volumes. The project was funded by an Advanced Investigator Grant awarded to Bode by the European Research Council (ERC). Indeed he was the first literary scholar in Europe to receive such an accolade. 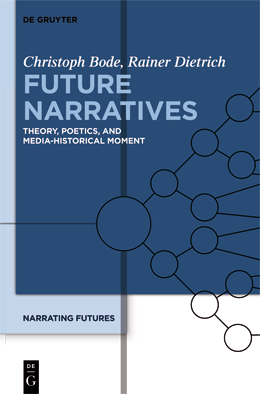 In the first volume of the “Narrating Futures” series, Bode defines “future narratives” as story-telling structures that are characterized by the systematic use of nodes, or situations that allow for more than one continuation, which allow the author to pursue alternative plotlines and thus to acknowledge and represent the multilinear potential of the future. In other words, “future narratives” contain at least one instance of a structural node at which the text offers at least two alternative possible lines of development for the continuation of the tale, thus dispensing with the use of a unilinear sequence of situations and events. In addition, this volume proposes a classification scheme and a specific poetics for this form of narrative and offers an abstract mathematical description of its defining features. For instance, the book provides a preliminary definition of the “nodal power” of a branch-point in a narrative, which is a measure of the degree of open-endedness it makes available, or the space of possibilities it opens up. It also situates the emergence of this type of multilinear story-telling in the media-historical evolution of the last 300 years or so. "The conditions necessary for the initial appearance of this form of storytelling seem to have been in place by around the year 1700. The fact that it became highly prominent only in the last 35 years of the 20th century can arguably be attributed to developments in media technology,” says Bode. Volumes 2-5 of the series analyze how future narratives have been implemented in different media – in text, in the cinema, on video, and in computer games. The final volume in the set takes up the topic of alternate histories, i.e. historical novels that use the “what if?” approach to explore alternative courses that history, and the stories embedded in it, might have taken at various crucial turning-points in time. The project “Narrating Futures” was the first such venture in the Humanities to win grant support worth on the order of a million euros from the ERC. ERC Advanced Investigator Grants are designed to promote innovative research that promises to significantly extend the frontiers of its field and establish new areas of research areas for future development.